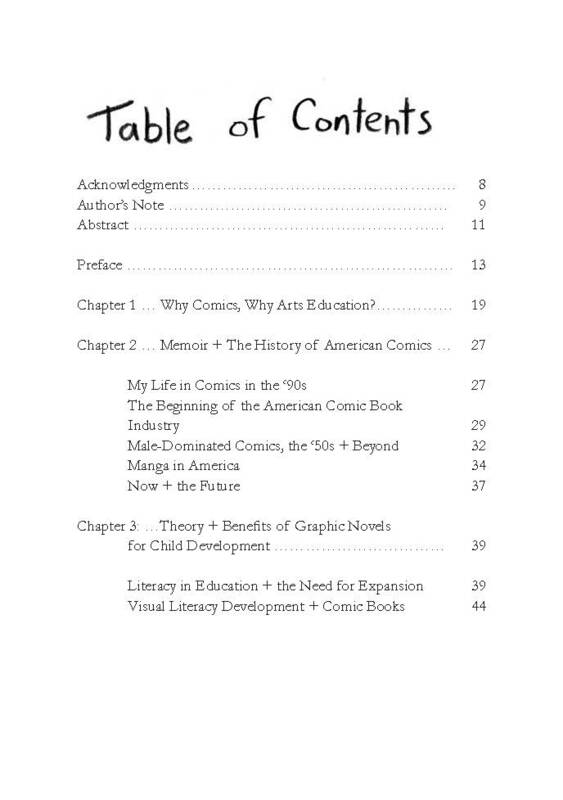 Developing the Cartooning Mind, My Graduate Thesis — Comic Art Ed! Hello! Earlier this month I earned my masters degree from the Rhode Island School of Design. I was in the Teaching + Learning in Art + Design department, where I completed by thesis titled Developing the Cartooning Mind: The History, Theory, Benefit and Practice of Comic Books in Visual Arts Education. Below I am sharing the abstract for the final 94 page work, as well as the table of contents. This thesis by cartoonist and educator Cathy G. Johnson explains why cartooning should be taught in visual arts classrooms. The theme is supported by historical research, professional inquiry, child development research, and analyses of pedagogical approaches. Johnson traces the history of the U.S. comic book industry from its beginnings during the Great Depression, through the anti-comics movement of the ‘50s, male-dominated comic shops of the ‘70s, and the eventual Japanese import comics boom of the ‘90s. She uses the personal narrative of her engagement with comics as a child in the ’90-‘00s as a case study to explain the current flourishing graphic novel industry. The thesis then shows the importance of literature in education; literacy is necessary not only for the purposes of reading, but for understanding and being fully present in the world. Research shows that children of marginalized experience are being underserved and neglected by their schools. Educational methodologies and the content of available literature favor children whose experiences already align with the majority. The thesis then goes on to describe the benefits of intertwining the visual and verbal, and how that plays to the strengths and competencies of children of marginalized experience. Images and words together clarify communication and illuminate possibilities. To conclude, this thesis summarizes the learning outcomes of sample cartooning curriculums and how these approaches can be expanded. Future work building on the research presented here can include lesson plans that put theory into practice.